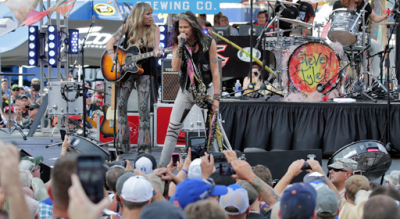 Our 2019 Bristol Motor Speedway Bass Pro Shops Night Race NASCAR race packaegs, travel packages and tours include excellent Bristol Bass Pro Shops Night Race tickets (the most coveted race ticket in NASCAR) and Xfinity Series Tickets, hotel accommodations at the Fairfield Inn by Marriott-Kodak/Sevierville,TN, deluxe continental breakfast daily, roundtrip bus transfers Friday and Saturday to Bristol Motor Speedway, a pre-race tailgate party Saturday, knowledgeable and experienced tour representatives, and much more. We also offer pre-race track tours and scanner rentals. This is the single most popular race on the circuit. Make your reservation now as this one sells out early! Race tickets for the Monster Energy Cup Series are in the Waltrip, Allison, and Kulwicki Grandstands, rows 7-48 depending on the grandstand. These grandstands are located on the front-stretch and in turns one, two & four. 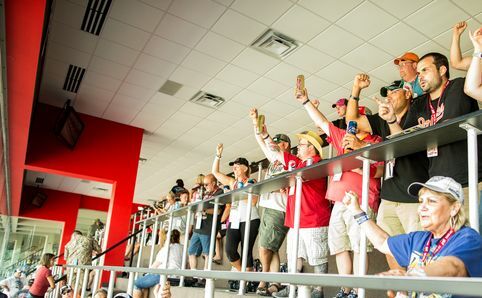 Great Xfinity Series tickets are located in the Kulwicki and Waltrip Grandstands in turns one and four. Our seats in the turns are in elevated grandstands where row 1 is equal to row 20 on front stretch. You can see the entire track and pit roads. They are not too low or too high. Perfect! Our seats in the Allison grandstand on the front stretch are in the upper rows insuring that you will have a view of the entire track. You will be able to see the entire track and the pits without any obstructions. 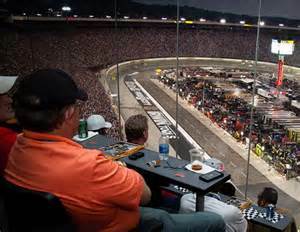 We also have upgraded seats available for the Pearson and Earnhardt Terraces. These upgraded seats are stadium style folding chair seats. A 2nd deposit to equal $300.00 per traveler is due by May 20, 2019.